Clean air – we all want to know our air is healthy. But too many of us breathe dirty air every day, especially in our towns and cities. Air pollution is a hidden killer and it hits children, older people and the poorest hardest. Air pollution costs lives and billions of pounds. It is one of the UK’s biggest killers, causing 40,000 early deaths  in the UK every year. That’s more than obesity or alcohol. Dirty air leads to worsening asthma symptoms, heart disease and even lung cancer. Air pollution has even been associated with changes in the brain linked to dementia and can lead to children growing up with smaller lungs. Air pollution comes from many different sources and the most serious air pollutants are nitrogen oxides and particulates. 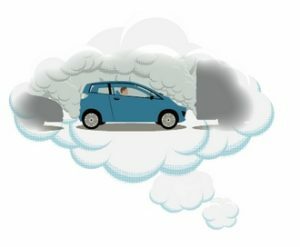 Vehicle exhausts produce harmful gases and tiny particles of soot and other ‘particulate matter’ that cause health problems and harm our environment. Road transport is largely responsible for some of the most dangerous pollutants and In Greater Manchester accounts for 65% of nitrogen oxides and 79% of particulate emissions, along with 31% of carbon dioxide emissions. Half of all trips made in Greater Manchester are less than 1.25 miles and 30% of these trips are made in cars. Nearly 9 out of 10 of the trips within Greater Manchester are of 5 miles or less, and more than half of these are by car. 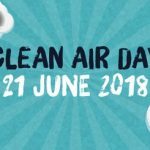 Thursday 21st June is national Clean Air Day and people in Greater Manchester are encouraged to “Leave the Car at Home” to travel to study or work by walking, cycling or by public transport. 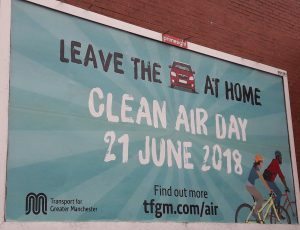 Transport for Greater Manchester are asking people to make a Clean Air day pledge to ‘Leave the Car at Home’ on 21st June and walk, cycle or use public transport. Last year 2500 people in Greater Manchester made a Clean Air Day Pledge. Andy Burnham, GM Mayor pledged to travel by bus once a week. Call on our community, business and political leaders to lead from the front! walk or cycle for short journeys? use public transport for longer journeys? ask what your workplace / organisation is doing to encourage people to travel more sustainably? 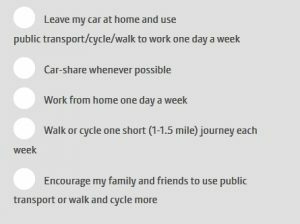 Join us in calling on local businesses, organisations and council leaders to make a pledge to change how they travel to work on Thursday 21st June and make the changes to make walking, cycling and public transport more convenient, safer and more affordable. Manchester Friends of the Earth have created an easy-to-use Twitter action so that you can send tweets to local council leaders, business and community leaders asking them to lead from the front.